AnceStories: The Stories of My Ancestors: Who Are You? A CROTHERS Family Member? When I began researching my paternal grandmother's biological family, one of the first cousins I "met" online was Sharon. She had done quite a bit of research on our CROTHERS line (my paternal grandmother's birth surname was YORK, and her great-grandmother York's maiden name was Anna CROTHERS). Sharon and I exchanged quite a bit of information (she's related two, possibly three, ways! ), and then she generously loaned me some negatives of photographs her daughter-in-law had taken of some CROTHERS family members' antique photographs held by a mutual cousin. This was in the days when most people didn't have scanners, as they were fairly expensive, and sending scanned photographs via e-mail wasn't convenient since dial-up Internet service was the norm. I had prints made from all the negatives and returned them to Sharon. She had been able to identify all the individuals in the photographs, probably because they were labeled, with the exception of the one above. Ever since I laid eyes on this photograph, I've wondered, "Who are you?" For many years, I thought this woman could be my 3rd-great-grandmother, Anna (CROTHERS) YORK or even, perhaps, her mother, Mary "Polly" (WYCKOFF) CROTHERS CHAPPEL, who made the cross-stitch sampler I so serendipitously inherited. 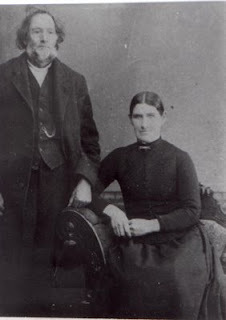 Using Uncovering Your Ancestry through Family Photographs by Maureen Taylor and Dating Old Photographs: 1840 - 1929 and More Dating Old Photographs: 1840 - 1929 by Moorshead Magazines, I was able to determine that this woman could not be either of my ancestors; she was much too young. Now, it's too bad that I cannot see the mounting or frame of this photograph to tell whether it was on a cabinet card or framed and hanging on a wall somewhere. The mounting or back of the photo might have given me a clue as to the name and location of the photographer. I can't even tell what type of photography process was used, of course. But by examining the clothing and hairstyle, I was able to narrow down the time frame. I'm certainly no Photo Detective, but thanks to her writings and by comparing the styles in the Dating books, I am hopefully improving my deduction skills! First of all, this woman's dress fabric has a shiny element to it. I'm hopelessly ignorant of fabrics, but what comes to mind is a dark-colored silk or satin. It has an elaborately made bodice, with lots of shirring, both vertical and horizontal. The opening appears to be fastened (probably by tiny thread loops) with miniature buttons set in threes. Additionally, there are larger, apparently cloth-covered buttons set at a diagonal at each side of the bodice, from the shoulder towards the center. The sleeves have some fullness in the upper part, but are not noticeably huge. The collar is stand-up with lace trim, with what appears to be a lace ribbon around the collar's circumference. Both laces are white or light-colored. Either the collar is very tight or the woman has a full neck. It is difficult to tell whether the bodice is tight-fitting or loose, but I venture to guess the latter. I first started estimating the dress in the 1885 - 1895 era, but the more I compared it with other photographs, the later I dated it, until I feel it compares well with those of the 1905 - 1910 era. The woman's hairstyle was the clincher for me in dating the photo. Most women's hairstyles in the 1885 - 1895 era consisted of hair parted in the middle with a tight bun at the back of the head and frizzled bangs, even on mature women. In the 1905 - 1910 era, the bangs disappear, and we see loose buns at the top of the head like this. 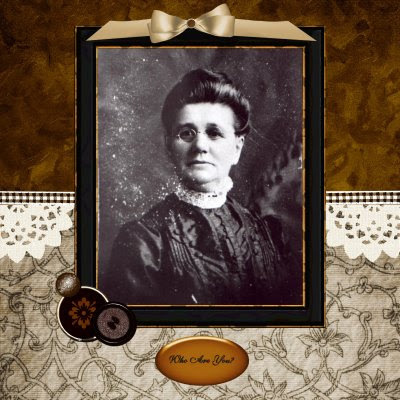 She wears no visible accessories, save for the pince-nez eyepiece with a hard bridge, popular from the 1890s on. As to the woman herself, she is mature but not elderly; serious, but not stern. Her earlobes are unattached, her nose is medium-sized (as are many of her features), her light-to-medium-colored eyes are somewhat hooded, and her mouth is slightly turned down. Her skin is smooth and unwrinkled, except for some crow's feet. No dimples or cleft appear. Her dark hair shows no significant gray or white. I would wager that she is perhaps in her late forties or early fifties, placing her birth date in the 1855 - 1870 range. What was the occasion for this photograph? A milestone birthday or wedding anniversary, with a photograph of her husband missing from this collection? 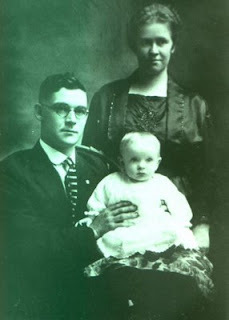 Last is a photograph of Vernon as an adult with his wife and infant. This particular shot of "Vernie" bears a striking resemblance to our mystery woman, which is what has prompted my latest theory that she is Nellie (PHELPS) DRAKE, Vernon's mother. The fact that both the mystery woman and Vernie wear glasses not only causes them to look similar, it makes me wonder about the genetic disposition towards vision problems. Many of the photographs in this collection are of individuals in Nancy's branch of the CROTHERS tree, which certainly adds credence to my theory. The mystery is still unsolved, but we are a bit closer to its conclusion. I'd especially like to thank the footnoteMaven for giving us a chance to highlight our mystery photos and spend some time playing sleuth! Written for the 9th Edition of the "I Smile for the Camera" Carnival: Who Are You? I'd Really Like to Know! Unidentified Woman. Second-copy print of original photographed c. 1996 by unnamed daughter-in-law of Sharon Crothers Flood, [ADDRESS FOR PRIVATE USE,] Bay City, Michigan. Second-copy print held by Miriam Robbins Midkiff, [ADDRESS FOR PRIVATE USE,] Spokane, Washington. 2009. Phelps, John S. and wife Nancy Amanda (Crothers). C. 1887. Second-copy print of original photographed c. 1996 by unnamed daughter-in-law of Sharon Crothers Flood, [ADDRESS FOR PRIVATE USE,] Bay City, Michigan. Second-copy print held by Miriam Robbins Midkiff, [ADDRESS FOR PRIVATE USE,] Spokane, Washington. 2009. Drake, Vernon P., Lawrence, and Ruth May. C. 1910. Second-copy print of original photographed c. 1996 by unnamed daughter-in-law of Sharon Crothers Flood, [ADDRESS FOR PRIVATE USE,] Bay City, Michigan. Second-copy print held by Miriam Robbins Midkiff, [ADDRESS FOR PRIVATE USE,] Spokane, Washington. 2009. Drake, Vernon and family. C. 1920. Second-copy print of original photographed c. 1996 by unnamed daughter-in-law of Sharon Crothers Flood, [ADDRESS FOR PRIVATE USE,] Bay City, Michigan. Second-copy print held by Miriam Robbins Midkiff, [ADDRESS FOR PRIVATE USE,] Spokane, Washington. 2009. Butterfly Art Studio. "Aunt Jeannine's Attic Mini Kit." Embellishments. Viewed 3 November 2008 at http://www.myscrapshop.com/gallery/displayimage-20-27.html. Frye, Trish. "A Moment in Time." Papers, frame, and embellishments. Viewed 13 November 2008 at http://www.myscrapshop.com/gallery/displayimage-20-32.html. Moorshead, Halvor, editor. Dating Old Photographs: 1840 -1929. Toronto, Ontario: Moorshead Magazines, Ltd. 2004. Ibid. More Dating Old Photographs: 1840 -1929. Toronto, Ontario: Moorshead Magazines, Ltd. 2006. Taylor, Maureen. 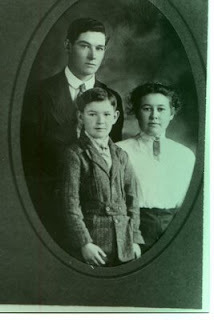 Uncovering Your Ancestry through Family Photographs. Second edition. Cincinnati, Ohio: Family Tree Books, 2005. Wikipedia, Pince-nez, viewed 10 January 2009 at http://en.wikipedia.org/wiki/Pince-nez. A photo of a photo does add extra mystery. You have done very well in narrowing down the time frame and list of possibilities. I hope you get a positive identification.